There are a number of martial arts styles and schools of Russian origin. Traditional Russian fist fighting has existed since the 1st millennium AD. It was outlawed in the Russian Empire in 1832. However, it has seen a resurgence after the break-up of the Soviet Union. 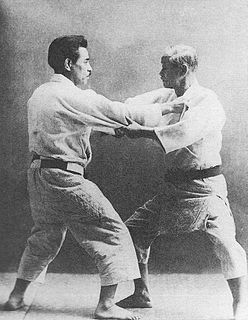 During the Soviet era, the government wanted to create both military hand-to-hand combat systems and combat sports, resulting in the creation of sambo. During the 1980s and after the fall of Communism the interest in the folk martial arts was reawakened. Through ethnographic study, many new styles based on the folk styles appeared. Russian fist fighting (Russian - Кулачный бой Kulachniy boy "fist fighting, pugilism) is the traditional bare-knuckle boxing of Russia. The earliest accounts concerning the sport date to the 13th century. Sambo (Russian: са́мбо, IPA: [ˈsambə]; САМозащита Без Оружия) is a Russian martial art and combat sport. The word "SAMBO" is an acronym for SAMozashchita Bez Oruzhiya, which literally translates as "self-defense without weapons". Sambo is relatively modern since its development began in the early 1920s by the Soviet Red Army to improve their hand-to-hand combat abilities. Intended to be a merger of the most effective techniques of other martial arts, sambo has roots in Japanese judo, international styles of wrestling, plus traditional folk styles of wrestling such as: Armenian kokh, Georgian chidaoba, Romanian trîntǎ, Tatar köräş, Uzbek kurash, Mongolian khapsagay and Azerbaijani gulesh. The pioneers of sambo were Viktor Spiridonov and Vasili Oshchepkov. Oshchepkov died in prison as a result of the political purges of 1937 after accusations of being a Japanese spy. Oshchepkov spent much of his life living in Japan and training in judo under its founder Kano Jigoro. The two Russians independently developed two different styles which eventually cross-pollinated and became what is known as Sambo. Compared to Oshchepkov's judo-based system, then called "Freestyle Wrestling," Spiridonov's style was softer and less strength dependent. This was in large part due to Spiridonov's injuries sustained during World War I.
Anatoly Kharlampiev, a student of Oshchepkov, is often considered the founder of sport sambo. In 1938, it was recognized as an official sport by the USSR All-Union Sports Committee. Systema (Система, literally meaning The System) is a Russian martial art. Training includes, but is not limited to: hand-to-hand combat, grappling, knife fighting, and firearms training. Training involves drills and sparring without set kata. ARB (Russian: Армейский Рукопашный Бой; Armeyskiy Rukopashniy Boy; 'Army Hand-to-Hand Combat') is a Russian martial art of training for protection and attack receptions that incorporated many functional elements from an arsenal of individual hand-to-hand combat and martial arts styles from around the world, and has been used in real fighting activities. ^ "Russian Martial Arts". Completemartialarts.com. Retrieved 2014-05-23. 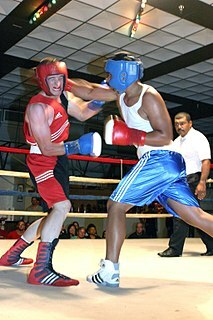 ^ Russian Fist Fighting. "Летописцы наши говорят об ней, еще в начале XIII в. [Our sources talked about it already at the 13th century.]" ^ a b Schneiderman, R.M. (June 19, 2010). "Once-Secret Martial Art Rises in Ring's Bright Lights". The New York Times. ^ "Once-secret KGB martial art fights for recognition". Time Live. Retrieved December 4, 2010. ^ "Биография Виктор Спиридонов". Peoples.ru. 2013-03-07. Retrieved 2015-10-15. ^ "Systema at Black Belt magazine website". Black Belt. Retrieved 2014-02-06. Systema is a Russian martial art. There are multiple schools of systema that have began appearing after the end of the Soviet Union in the 1990s, with teachers claiming their respective "systems" to purportedly originate from traditional fighting styles of the Cossack and East Slavic peoples and/or be derived from alleged secret techniques of Soviet special forces. Anatoly Arkadyevich Kharlampiyev was the world famous researcher of various kinds of national wrestling and martial arts, Merited Master of Sports of the USSR, Honored Coach of the USSR. He was one of the founders of Sambo, a martial art developed in the Soviet Union. Kharlampiyev worked as a physical education trainer at the Communist University of the Toilers of the East, and also was dedicated student of boxing, having also studied fencing, acrobatics, and mountaineering. In 1938, Kharlampiyev presented Sambo to the USSR All-Union Sports Committee, which recognized the martial art as an official sport. ARB is a Russian martial art of training for protection and attack receptions that incorporated many functional elements from an arsenal of individual hand-to-hand combat and martial arts styles from around the world, and has been used in real fighting activities. 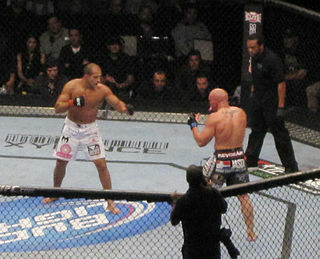 The modern and quickly developing form of the martial art is single combat which have received popularity for full contact duels while offering minimum risk of trauma to sportsmen.